The San Francisco International Film Festival is in full swing right now and as usual the fest has a great lineup of world cinema. Although my viewing schedule was very truncated due to life circumstances I still had a quality film festival experience over the first weekend. I started my mini-marathon with Hirokazu Kore-eda’s latest film, The Third Murder. As per usual Kore-eda goes directly to the psychological heart of his characters, examining their motivations without judgment or prejudice. In The Third Murder a seemingly straightforward homicide investigation takes several unpredictable turns and eventually leads down many unexpected paths. Almost every character presents an unreliable point of view, contributing to the many shades of gray of complicity and blame. Yet Kore-eda emphasizes the compassionate over the judgmental and the film’s open-ended conclusion questions assumptions of guilt and innocence. The Third Murder is beautifully lit and shot, with Kore-eda using gliding zooms and slow pans to delineate the cinematic space. The film also makes great use of reflection and mirroring to suggest complicity and transference of guilt, since almost everyone in the film lies at one point or another. Performances are also on point, led by the ever-awesome Yakusho Koji (Shall We Dance? The Eel) as the man accused of murder, and the dapper Fukuyama Masaharu (Like Father, Like Son) as the lawyer assigned to the case who begins to doubt everything and everybody as the film progresses. I continued my festival viewing with A Man Of Integrity, by Iranian director Mohammad Rasoulof. Like his compatriot Jafar Panahi, Rasoulof has been arrested in his home country and banned from making films, so A Man Of Integrity was shot on the down-low in a wintry northern area of Iran. The film is a bitter and intense drama about a family settled in a remote Iranian village that comes face to face with the town’s intractable corruption and cronyism. The delicate and vulnerable goldfish that they farm become a metaphor for the family’s tenuous status in the town, and the film is grounded in strong and intense performances by Reza Akhlaghirad and Soudabeh Beizaee as the couple who stand up to corruption in the village. Vivian Qu’s Angels Wear White also looks at corruption and power dynamics, this time in a seaside village in China. It’s a gripping narrative about the aftermath of an assault on two schoolgirls and the reverberations of that crime on its small-town location. Director Qu captures the precarious position of the female characters in the film, most of whom are suffering under a sexist and paternalistic system, and she brings out great performances from both the adults and the preteen and teenage actors. Also of note is the film’s excellent editing which moves the story along at a steady and assured pace. The White Girl features some beautiful cinematography by the legendary cameraman Christopher Doyle (Chungking Express), who co-directed the film with Jenny Suen. Set in one of the last fishing villages in Hong Kong, the film follows a young woman known for her very pale complexion that she protects religiously, supposedly due to her allergy to sunlight. Along the way she encounters a mysterious dude (Joe Odagiri) who lives in a ruined building that is also a camera obscura. Added to mix is an evil developer who wants to pave over the cute fishing village and a subplot involving the white girl’s mother, a famous singing star who long ago abandoned her partner and daughter. The film is heavy with allegory about Hong Kong’s current struggles with China and is a little too elliptical for my taste, but it’s always a pleasure to hear Cantonese dialog. I rounded off my viewings with Bing Liu’s Minding The Gap, which blends character-driven verite with personal documentary. The film follows Liu and two of his skateboarding friends who talk about surviving life in Rockford, a picturesque city about 1.5 hours outside of Chicago that in fact suffers from a high crime rate, most of which is due to domestic violence. The film becomes cathartic for its three distinct and sympathetic characters, including Liu himself, revealing the struggles each encounters in reconciling their painful histories with their current lives. It’s the kind of humanistic doc that Kartemquin Films (which executive-produced the film) is known for, their most famous film being Hoop Dreams. Minding The Gap is good, solid documentary filmmaking that isn’t afraid to touch on difficult topics like alcoholism, wife beating, and child abuse. Also upcoming this week—the US premiere of John Woo’s latest actioner Manhunt, which may or may not be a return to his past heroic bloodshed glory, Sandi Tan’s personal documentary Shirkers, Hong Sang Soo’s latest Claire’s Camera, and Lee Anne Schmitt’s essay film Purge This Land, among many other cinematic treats. Despite its cringeful pre-release marketing campaign I went into seeing The Great Wall with a semi-open mind. Zhang Yimou has directed some good films during his career and I was curious to see what he could do with US$150 million dollars. But right off the bat it was clear that despite being co-produced by one of the biggest production companies in China, Wanda Dalien (along with US-based Legendary Pictures), set in ancient China, and featuring a boatload of Chinese movie stars, this was going to be all about the white dude. Though I shouldn’t be surprised, I am a bit fatigued by the continuation of the white savior trope, wherein white guys rescue the benighted yellow people once again. The film starts with a trio of European mercenaries fleeing across the Gobi desert, including Matt Damon as a character named William who speaks with a slight Irish accent, another guy who is Spanish, played by Chilean American actor Pedro Pascal, and a third guy who dies pretty quickly. Right away we know it’s going to focus on the surviving European dudes because Hollywood, and sure enough the story is told almost completely from their point of view. The movie is seductive because it is so slick and beautifully packaged and is palatable and easy to watch. It’s seemingly respectful of Chinese culture—there are no evil Asiatic villains and several of the Chinese characters are noble and heroic, if incredibly clichéd. The film presents Chinese culture as refined and aesthetic, which is clearly meant to appeal to PRC audiences. But the narrative exists only to center the white heterosexual male perspective, so it’s no surprise that the screenplay is of course written by a white dude. Although it may seem like there are a whole lot of Chinese people in the movie they in fact are mostly window dressing who exist mainly as props for the white protags. The film actually posits that there are no archers in the entire elite Chinese regiment that’s been training for sixty years who are as good as the white dude. There’s also the highly questionable plot point that China didn’t have any magnets in their possession until white people brought them. This is especially insulting considering that the Chinese were the first to document the use of magnets and magnetism around 1088 AD. I mean, wtf? The premise that a woman could be a general in ancient China is also a male fantasy of inclusion and equality that conveniently ignores the historic patriarchy and paternalism inside and outside of China that would have made this impossible. Mulan is a believable legend because it acknowledges that a woman could only be accepted in battle if she dressed like a man.The Great Wall presents females as accepted in the military hierarchy, even to the point of one of them becoming the supreme leader of the troops. While I’m all for strong female characters, the erasure of the historical oppression of women denies the suffering women have experienced in the patriarchy. Ultimately, General Lin, the female commander in The Great Wall, is a guilt sop that pretends a history of fairness and equality that didn’t exist. I suppose I should be grateful that the chaste and muted attraction between William and Lin is unconsummated or I would have run screaming from the theater. Everything in the film is an excuse to get Matt Damon more screen time and it’s especially frustrating to see some of the biggest stars in China in what amounts to extended cameos. If you blink you would miss Lin Genxing, Lu Han, Eddie Peng, Zhang Hanyu, and more. In fact, seeing how ferocious Eddie Peng is in his three minutes onscreen made yearn for him, not Matt Damon, to be the protagonist of the film. Andy Lau and Jing Tian are the only Chinese actors with more than a handful of lines in the film and only the hot Asian babe in the shiny breastplate gets to have any notable character development. Even the scary monsters that provide the main threat in the narrative are only partially baked, looking like a cross between orcs, dinosaurs, and the nasty creature from Alien. All in all, the movie is a confused mess of that fails to resolve in any satisfying way.The Great Wall is another fail from Hollywood (with an assist from Wanda Dalien, which has been trying to break into the US market for a while). Thank god CAAMfest is coming up next month to give us some movies about real Asian/Americans from our perspective, instead of the usual white-dude-centric nonsense perpetuated by this film. UPDATE: Looks like THE GREAT WALL tanked at the box office in the US, and may also be taking down the entire US-China coproduction industry with it. Can’t say that I’m sorry. In fact I’m very not sorry at all. In an interesting coincidence, two famous Chinese-language film directors have films opening in the U.S. this weekend, but their respective movies might puzzle the casual viewer expecting a certain type of cinematic output from each director. But on closer inspection both movies are in some ways throwbacks to early periods of each director’s filmmaking careers. Starting with Hero (2002) and continuing through House of Flying Daggers (2002), Curse of the Golden Flower (2006), and The Flowers Of War (2011), Zhang Yimou for the most part in the 21st century made a series of glossy commercial films that have been successful marketed in the West, and he capped off this run of box-office hits by overseeing the much-lauded opening ceremony for the 2008 Beijing Olympics. So viewers who only started following Zhang’s career in the 21st century might think that his oeuvre is all about wire-fu, movie stars, a hypersaturated color palette, and an affinity for spectacle. But Zhang started out in the 1980s as one of the so-called Fifth Generation of Chinese directors who were noted for their realistic styles and politically astute commentary. Often depicting the ordinary lives of peasants in China’s rural countryside and usually starring Gong Li, Zhang’s first several features were poetic ruminations on the effects on everyday people of various types of systematic repression. These movies, including Ju Dou, Red Sorghum, Raise the Red Lantern, and The Story of Qiu Ju, made Zhang the darling of the arthouse film festival set, so it was a bit of a surprise when he busted out with a string of martial-arts fantasies at the turn of the 21st century. But those later films were pretty big at the box office and thus many folks only know Zhang as a director of big-budget spectacles, so it might seem like a surprise that Zhang’s latest film, Coming Home, includes neither martial arts nor brightly colored costumes and sets. Astute observers, however, will realize that the movie actually harkens back to Zhang’s earlier Fifth Generation output from the 1980s and 90s. Coming Home is a family drama set during and just after the Cultural Revolution in China and is based on the novel The Criminal Lu Yanshi by popular Chinese author Yan Geling (whose novella 13 Flowers of Nanjing was the basis of Zhang’s recent film The Flowers of War). The movie opens as former professor Lu Yanshi (Chen Daoming) surreptitiously arrives back at his town after escaping from a re-education camp. His devoted wife Feng Wanyu (Gong Li) attempts to meet him but is thwarted by the Chinese secret police and Lu is sent back to prison. Lu and Feng’s teenage daughter Dandan (Zhang Huiwen), an aspiring ballerina, resents her dad’s outlaw status since it’s messing with her career plans to play the lead soldier/dancer in the school play, which Zhang drolly depicts as leftist musical featuring dancers en pointe who are wielding rifles in the service of the revolution. Cut to several years later, after the end of the Cultural Revolution in the mid-70s. Lu again returns home but Feng has become addled from either a blow to the head, PTSD, early-onset Alzheimer’s, or a combination of all three, and thus doesn’t recognize him. The film then follows Lu’s attempts to reconcile with the amnesiac Feng. 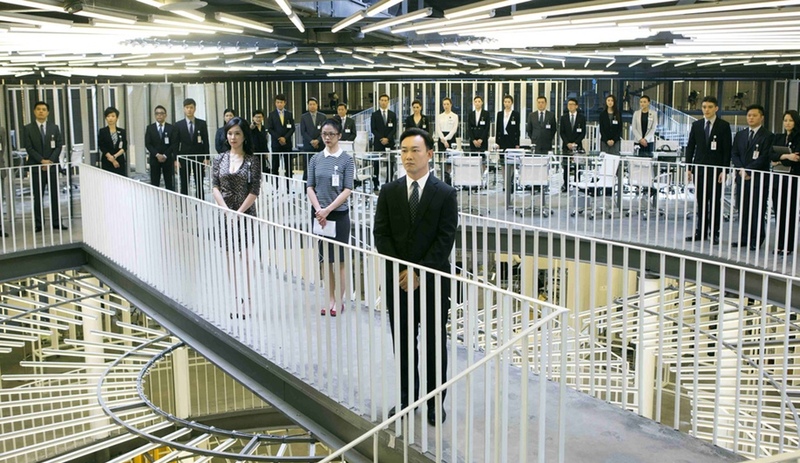 Also releasing in North America this weekend is the latest from Johnnie To, Office. Like Zhang’s movie, Office at first may seem like an anomaly in its director’s catalog but in fact the film, which is a musical comedy, has a lot in common with To’s past work. Though To is best known in the West for hardboiled crime movies like The Mission, Election, Exiled, and his last film, Drug War, he’s got a much more varied back-catalog than that. To got his start directing at Hong Kong’s television studio TVB and there he directed everything from romances to comedies to martial arts historicals, including the famous period drama The Yang Family Saga. His prolific filmmaking output includes the fantasy action films The Heroic Trio and The Executioners, the comedy farces The Eighth Happiness and The Fun, The Luck, The Tycoon, and Stephen Chow vehicles Justice, My Foot and The Mad Monk. Although his crime films have won him much love among Asian film fanpeople, To’s most commercially successful movies have been romcoms such as Needing You and Don’t Go Breakin’ My Heart 1 & 2. So it’s not as far-fetched as it might initially seem to be that Office is a musical, with all of its leads (except Chow Yun-Fat) singing at least one song in the film. The movie is a typical workplace drama infused with cogent commentary about the crisis of capitalism, The storyline follows two young acolytes at their first days on the job at Jones & Sun, a seemingly innocuous Hong Kong cosmetics company that’s actually in the throes of backstabbing and backroom deals. President Ho (Chow Yun-Fat) has a wife in a coma and Chinese investors knocking at his company’s door, while CEO Cheung Wai (Sylvia Chang) struggles to keep the company’s profits up and its products relevant. 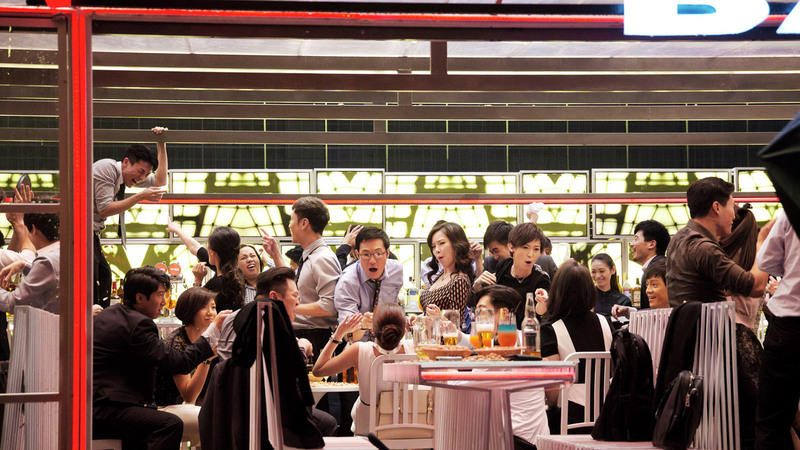 Salesman Wong Dawai (Eason Chan) is climbing the corporate ladder and is not averse to using personal relationships, including ones with CEO Cheung as well as fellow office drone Sophie (Tang Wei), in order to advance. Youngsters Kat (Tien Hsin) and Lee Xiang (Wang Ziyi) round out the ensemble. But despite a stellar cast who admirably perform both acting and singing duties (with Cantopop superstar Eason Chan being the best and Tang Wei the worst among the vocalists), the real star of the show is the astounding art direction and set design by acclaimed veteran William Chang Suk Ping, who has won renown as the production and/or costume designer for innumerable classic Hong Kong films including In The Mood For Love, The Grandmaster, and Dragon Inn. Office was shot completely on a soundstage, with some outdoor scenes simulated via green screen, and Chang’s beautiful, stylized set dictates the mood of the film. Comprised mostly of brightly colored bars and rails, the set resembles a massive, skeletal architectural cage that encloses the action and the characters and lends a hermetically sealed, slightly claustrophobic feel to the film. The artificial staginess of the movie, with its simulated spaces and multiple levels of activity, recalls a Broadway musical more than a movie musical, with the set dominated by a huge, slowly revolving clockface. No pretense of realism is made in the film’s use of space, color, and structural elements, which adds to the knowing fakery of the movie’s design. Despite To being the titular director, the film displays the strong influence of Sylvia Chang, who wrote and produced the film as well as playing the lead as CEO Cheung Wai, and who has an impressive resume as the director of films such as Tempting Heart (1999), 20 30 40 (2004), and Murmurs of the Heart (2014). Chang’s hand is clearly evident in the narrative’s complex personal relationships and its focus on the collateral damage of corporate machinations. To’s romcom background also comes the fore as the movie’s love hexangle recalls the similarly structured romantic entanglement in his 2014 movie Don’t Go Breakin’ My Heart 2. The weakest element of the movie’s musical conceit is its curious lack of interesting choreography. Despite taking place on a boldly designed stage set that cries out for equally bold movement through and across it, the movement during the musical numbers is surprisingly limited. The action during the songs in Office consists of mostly of synchronized head nods and a few characters walking in rhythm together. Office could stand to take a few lessons from Bollywood musicals, whose song and dance numbers fill every inch of the frame with dynamic, kinetic movement. But all in all, the movie is a fascinating beast that promises to be brilliant up on the big screen. After first seeing in via online screener with tiny white subtitles I’m looking forward to watching it again in a movie theater where it belongs, and so should everyone, in my humble opinion.